A ruthless Rafael Nadal preserves his creaky knees for tougher tests by routing Dominican journeyman Victor Estrella Burgos to sail into the second round of the Australian Open. Rafael Nadal of Spain serves to Victor Estrella Burgos of Dominican Republic at the Australian Open in Melbourne on Monday. If Rafael Nadal gave the Australian Open a throwback feel last year with his straight-out-of-the-mid-2000s final against Roger Federer, he’s completed the retro effect this year with a return to his sartorial roots — a sleeveless T-shirt. 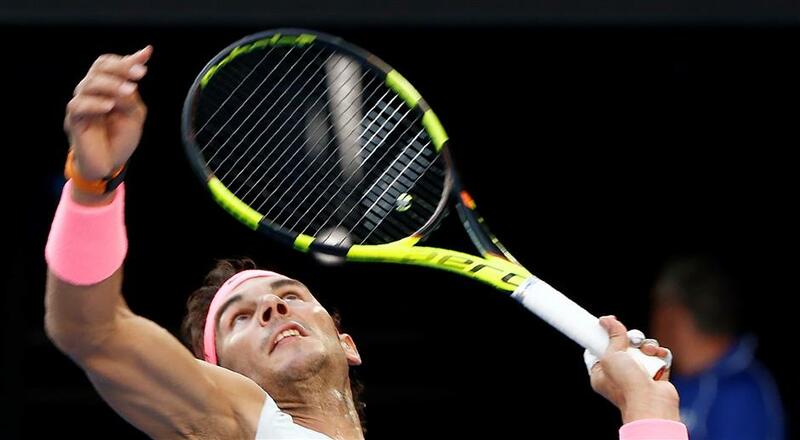 Matching the muscle-exposing tank top with neon pink shorts, wristbands and headband, Nadal also found his championship form again in a 6-1, 6-1, 6-1 rout of 37-year-old Victor Estrella Burgos in the first round at Melbourne Park on Monday. Nadal had been forced to withdraw from the ATP Finals in November due to a lingering right knee injury, and when the pain persisted, he also pulled out of a season-opening exhibition event in Abu Dhabi and his first tournament in Brisbane. With only a few exhibition matches last week to test his form, Nadal had doubts he’d be ready to go in time for the first major of the year. But a dominant performance against Estrella Burgos — he had 28 winners and saved five of six break points he faced — left him feeling positive about his start in Melbourne. “If I don’t feel myself ready, I will not be here. So I am happy to be here, happy that I’m on court again,” he said. Third-seeded Grigor Dimitrov advanced with a routine 6-3, 6-2, 6-1 win over qualifier Dennis Novak, while No. 6 Marin Cilic topped Vasek Pospisil 6-2, 6-2, 4-6, 7-6 (5) and local favorite Nick Kyrgios looked sharp in a 6-1, 6-2, 6-4 victory over Rogerio Dutra Silva. No. 10 Pablo Carreno Busta, No. 23 Gilles Muller, No. 24 Diego Schwartzman, No. 28 Damir Dzumhur, No. 30 Andrei Rublev and No. 31 Pablo Cuevas also advanced. No. 8 Jack Sock, No. 11 Kevin Anderson and No. 16 John Isner were among the losers. For Sock, who lost to Yuichi Sugita 6-1, 7-6 (4), 5-7, 6-3, it was a disappointing result given the impressive way he finished last season with a maiden Masters win in Paris and a first-time appearance at the ATP Finals. He came to the Australian Open sporting a career-high ranking of No. 8 and his highest-ever seed at a major. Marta Kostyuk became the first player born in 2002 to win in the main draw of a grand slam when she shocked China’s 25th seed Peng Shuai in straight sets. The 15-year-old qualifier from Ukraine beat the 2014 US open semi-finalist who, at 32, is more than twice her age, 6-2, 6-2.